The Audix FP5-Plus Pack is an affordable 5-piece Fusion drum microphone package that includes an additional F9 condenser instrument microphone. The FP5-Plus Pack is well suited for drum and instrument amplification in a live sound environment or for high-quality recording applications. The FP5 Fusion Series Drum Microphone Package from Audix consists of an f5 dynamic snare mic, three f2 dynamic tom mics, an f6 dynamic kick drum mic, four mic clips, four pivot mounts, one mic stand adapter, and an aluminum carrying case. The Fusion Series microphones, which are designed, assembled and tested by Audix in the USA, can be used for professional stage and studio applications. 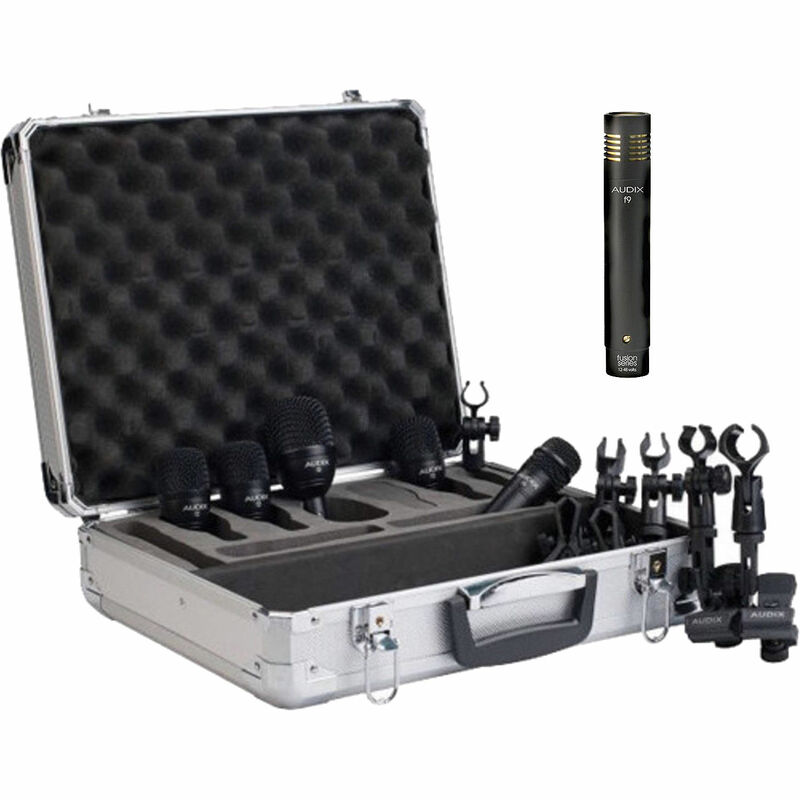 All mics come with high impact mic stand adapters and are packed in a heavy duty foam lined aluminum carrying case for safe keeping when the products are not in use. The F9 Condenser Instrument Microphone from Audix features a pre-polarized condenser element, a cardioid polar pattern, and a wide frequency response. It is suitable for capturing drum cymbals, overheads, hi-hat cymbals, and ambiance. The F9 operates on 12 to 48V phantom power, and can be used for both recording and sound reinforcement applications. It includes a snap-on microphone clip and a carrying pouch. Box Dimensions (LxWxH) 15.9 x 13.4 x 4.6"
Box Dimensions (LxWxH) 8.9 x 4.2 x 2.5"